The strongest geometric shape is the triangle. 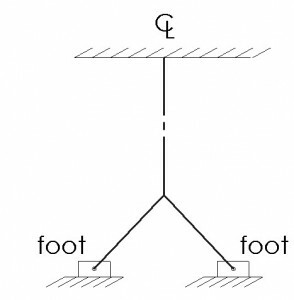 Straight lines from the inner arch of each foot connected along the body’s centre-line (CL) draws a truss. 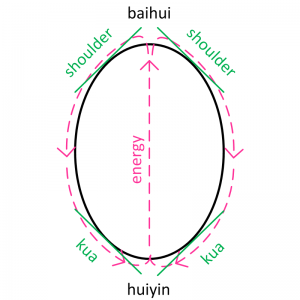 Keeping the end points of the CL – baikhui & huiyin – spatially restricted, an initiated action from one foot will cause the torso to turn in one direction along the CL. 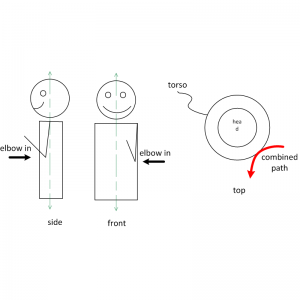 Similarly, pushing from the other foot will rotate the torso in the opposite direction. There should be no power on the upper body. Your action response should be independent of the receiving stimulus: it is you who causes your body to turn, not them. This first requires your CL to be locked at which time your initiated action catches them off guard (balance). 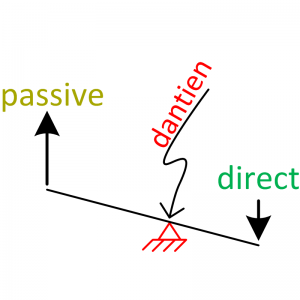 Provided a solid connection is established between contact points, your intended action will be compensated by an opposing moment about the dantien . Internal movements are like bicycle brakes: it’s the tightening of the cables that cause an action. Repeating steps 1-3 incrementally moves the screw along it’s longitudinal axis of rotation. Notice each step involves one action to move the screw on it’s intended course. Although each action is discrete, they are superimposed and not combined – a cardinal mistake on several fronts. If you read the above steps as a machine would (1′s and 0′s), the screw would travel straight and true every single time. For whatever reason most of us however read the steps and (sub)consciously add\remove others. Keep in mind a screw has only one function as far as it’s concerned (to penetrate) and only one method (spiral). If you made an honest comparison between what you are supposed to do and what you actually did, it’s safe to say they will never be the same. Hence the results will never be the same. But the importance lies in your intention: trusting the definition of the result and it’s method. In taiji parlance, if yin = support and yang = action, then 1–>2–>3 = yin/yang –> yin –> yang. Since 2 and 3 are discrete states, they must depend on ability. I surmise 1 to be the most difficult, important and elusive since it is not discrete. The fight before the fight. This action transmits significantly more power than just generating power from your arm. This reminds me of the good ‘old stiff-arm move characteristic of football and rugby players, in which an outstretched arm is locked like a bayonet except the on comers is bounced out. An example of the reverse situation – impalement – reminds me of a scene in the movie The Edge where a monstrous bear is killed. The hunters lure the bear with meat on the end of a long stake. When the bear rises on it’s haunches to attack, the defender – with superhero timing and nerve – orients the stake at the bear’s heart while placing the other end of the stake between the ground and a large boulder. When the bear falls forward, it’s own weight provides the necessary force for complete through penetration of the stake. 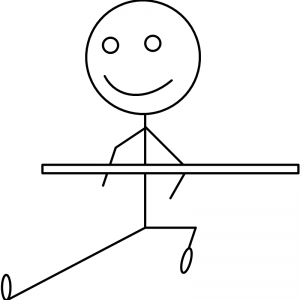 We want to apply the same idea except the stick is established via correct structural alignment of our body. The driving method can be done a myriad of ways, but the principles are always the same. There must be a connection formed between the ground and the contact point(s) for establishing the possibility for maximum power transmission. That’s why you have to have the head locked and strong, so when you push with a foot, the power coming up does not leak out the top; like pushing your head against a ceiling. This then forces the middle (internal) parts of your body to move more. This is why taiji is an internal art. Just remember, no matter what Lil’ Jon raps, do not bend over and touch your toes… Don’t look at yourself, you’re not that beautiful. This is why as a beginner it is good practice to do the Yilu as big as possible. In so doing you will naturally go lower to the ground We want to train the opposite of conventional fighting which emphasizes faster hands than feet. This requires that the bottom half is more flexible than the upper half of the body. Because of our jobs, many of us are too flexible in our upper half, so we need to work at the lower half to balance top and bottom. With sincere practice you will find bigger means more restriction since your body is not tuned to the increased range of motion. It is important to not move past the point where you physically hit a limit of rotation. You know you have reached this point when you sacrifice your fixed rotation point e.g. shoulder pops up. One benefit of going low as a beginner is to help prevent your kua from moving side to side. All the tension created helps stabilize the kua in preventing it from collapse. If you always practice in a comfortable high position, it is much easier to collapse the kua. Resolve the action, don’t move your spot. If you can stay steady, no up or down, you are working your ability for holding a spot. Then vary the distance of your step for experimentation. This will require that your body goes lower to the ground to step out further. Notice that resolving each action and increasing the length of step imparts more power on the bar. This is also why it is good to practice the form at a consistent low height while keeping the body straight. To step out even further, it would make sense to somehow step up with the rear leg, then repeat the procedure. The problem is how to do this without collapsing your structure i.e. bending forward? Differentiation. A by-product of exercise #1 requires the rear kua to be locked to allow the front leg mobility. In this case we do the reversal for the rear leg: do a ‘vertical crunch’ on the front shoulder-kua line and lock. This line establishes a perpendicular reference to the line your rear foot travels to step forward. 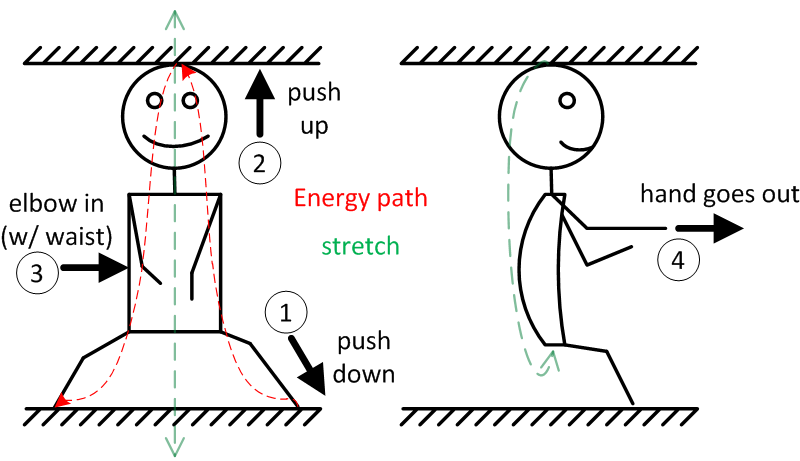 This configuration creates a clear differential in your body where the energy hits a wall is redirected to the ground. These exercises are excellent tools for push hands tactics. If you bend forward when pushing, you have already physically fallen. When you lean back, it is a mental fall since you are not accustomed to the position. Focus on bending their min-meng forward when one of their legs is locked. Both partners present same hand and foot. The wrists hook dorsally with the fingers always pointing at your partner. 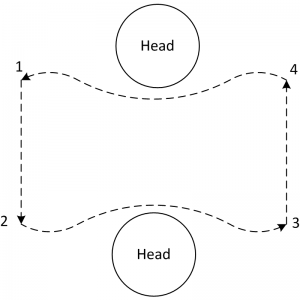 The general path the connected hands trace is shown in top view by the dotted lines in the diagram to the right. Each line should be distinct and clear, with succinct pauses at each corner. There should be no “interpolation” of movement at the corners to produce a smooth continuous flow. Use the same principles describes above e.g. feet initiate power and use the waist to rotate. Practice with power, trying to catch your partner by getting 2 points – the shoulder and hand – so they are double heavy, which then gives you acces to the third point – their dantien. 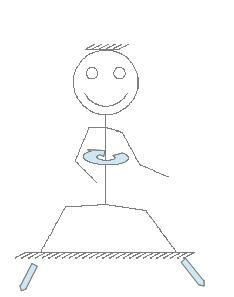 Imagine you are the body in the lower half of the diagram. Repeat the pattern but put an emphasis on corners 2-3 or 4-1. From your perspective on 4-1, try to place your fist on their chest. They should use the motion of a positive circle to neutralize your advance so your fist does not touch their body. The roles reverse on 2-3. Bearings have to be designed such that the balls are packed close together. It is this tightness that allows movement under extreme load. The more spaced apart the balls, the less it will be able to move. GM Hong said movements should be tight. The elbow comes in and rolls off the CL like water on a ducks back. All movements should be like this. The front and side views show that the elbow travels in towards the torso, or more specifically the ribs, while pointing down. The exact opposite happens on hand out. More importantly is what takes place between in and out. Like a duck’s back, the combined motion path of in/out should be curved. It is not as simple as straight in, straight out. For there to be a smooth transition, there has to be a series of rotations inside the body. Like a professional race car driver on the track, it is not so much the straight-away as it is the ability to handle corners which decides the winner of the race. If you jam or interrupt the motion, power will leak from the body and/or you will ‘catch’ yourself. Long ago the Daoist immortals made red pills to create this energy circuit in the body. The Emperors wanted the pills for themselves and killed all the alchemists. In response, the Daoist immortals made movements to produce the same effect. This physically necessitates the shoulders slope down and kua rotate up, permitting continuity for the energy to travel in a like manner, dubbed the Golden Elixir – the goal of internal energy work. We seek the ‘one’ – one movement which is so uncommon to humans that they do not know how to handle it. This is a perceived power because they cannot anticipate it. For example, the brass knuckle weapon is deadly since it is not a part of your body. It never moves. Therefore we seek to completely immobilize one part of the body while moving other ones. This is equivalent to wielding a weapon. The whole purpose o f Yilu is to to open up the ligaments between the kua and knee. When these open up, then the lower back – where power comes from – can then open because it is relaxed. Until then it is tight. Bounce stretch. This gets brain more comfortable with going lower. Stretching is all mental; you have to get the brain to allow the body to relax. This practices “sucking”, a secret transmission of some schools of Taijiquan. Ours is the same with more focus on the upper body. Bring back foot up without any movement or wobble of the front knee or upper body. This is where you practice “sucking” the trailing leg. Practice the splits and sucking everyday for a few minutes each. The goal is not in how much you do each day, but how often you keep it up i.e. consistency. These will stretch and strengthen your internals, most notably the tendon/muscle running down your interior thigh (gracilis)? 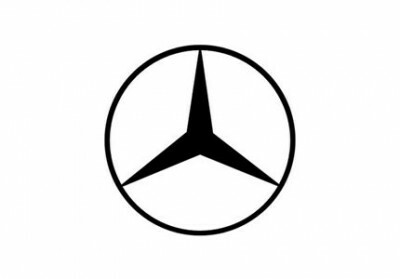 Well it’s not often you can get a Mercedes symbol, the cinnabar red immortal pill, and Lil’ John, all in one cohesive article, but you have managed to do it! All kidding aside, awesome work putting your notes together so clearly. Extremely helpful. Thank you. How to produce the red pills exactly ? It’s generally believed that external alchemists somehow refined Cinnabar (mercury sulfide), which gave the pill its red color, and lead, with other ingredients. Through a process of “cooking” ingredients in a “furnace” this pill was formed and ingested. Considering the fact that all these ingredients are toxic to human beings, as you might imagine, many people who ingested it died, or went insane from mercury poisoning. Some say that those able to survive the ordeal, eventually became immortal. Others say those who died immediately became immortal, and the level of immortality they achieved could be determined by the dead body’s condition. Internal alchemists later borrowed their predecessor’s language and gave hidden meaning’s to some of the ingredients and processes used. For example, in later literature “mercury” was associated with “mind” due to the mind’s mercurial nature (meaning that it’s easily stimulated and hard to stabilize) much like liquid mercury. “Fanning the fire” the way an early alchemist might stoke a fire to heat up his furnace, was later associated with a breathing technique where the abdomen is pumped in and out like a bellows in some internal systems (also known as “bellows breathing”). “Set up the furnace” has different meanings attributed to it and is really the only one relevant to us as Practical Method practitioners, as far as I know anyway. Indeed! Those notes are terrific. Thank you. Allan should now be the official note taker for the Toronto group. He has been producing detailed notes with amazing graphics. Way to go, Allan! Great notes with thanks, Allan, it helps a lot for our training. My question is assuming that the kua(s) are opened does that result in neutral equalibrium because the center of gravity is neither raised or lowered, basically by allowing those to be at the same level at the same time then potential energy, rotation, and reveloution are possible because if something with neutral equilibrium moves those around with follow, and then using joint rotation, you are using angular velocity which then turns into linear velocity, almost like a series of rotations(angular velocity occur) starting from the bottom up then transmitted to linear velocity, therefore if you have these continous angular velocity it is like a wheel continuously spinning around the axis while taiji has numerous axis points that are rotating. Statically the kua does not need to be open to deal with a force. Dynamically speaking, as far as equilibrium is concerned, the kuas’ ability to neutralize, as with many other points, is primarily a function of the degrees of freedom or being able to align with respect to vector(s). The kua area is very important since it is a major demarcation between top and bottom. How you align everything is rooted in the foundations or circles.